When Apple announced–actually, it was Mac boy Justin Long who made the news public–that the Mac versus PC campaign was to go in the circular file, most fanboys cheered. Probably. We knew that the “I’m better than you” ragging, diplomatically known as the Get a Mac campaign had come to the end of its three-year shelf life, but we weren’t sure what was coming next. The scene was set at the end of last month with the two-minute-long slot that, says TechCrunch’s MG Siegler, is more Mad Men than Mad Men itself. Satchmo, warm-toned photography, all that’s missing is the smell of apple pie. But last night, a further four FaceTime-themed spots were released. And it shows just how Apple is growing up and leaving its deep tech roots behind it. 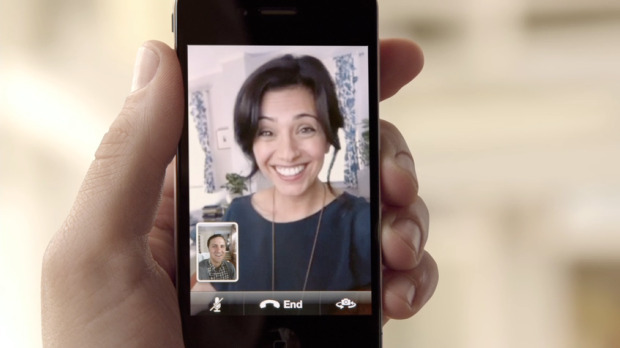 The new campaign for iPhone 4 forgets about the smartphone’s new features and focuses on one: FaceTime, which is rumored to be coming to a next-gen iPod Touch near you soon. The cold, hard tech specs are ignored in favor of just what the latest superphone can do for relationships, although not necessarily the boy-loves-girl variety. New Haircut, above, is the only spot about that kind of relationship. Nope, with Apple in 2010, it’s all about fatherhood. Here’s a forty-something dad getting his teenage daughter to smile, following a visit to the orthodontist. Steve Jobs as the paternalistic daddy of future tech? Well, we all knew that anyway, given his Godfather-esque control over the company he co-founded back in the Seventies. Is one of the reasons they’ve gone touchy-feely with the new campaign to do with drubbing that Jobs has been getting in the media recently? We may be a locked-down corporation, but we’re really only here for the nice things in life. So, grandparents, dads-to-be, father-and-daughter relationships. And haircuts. These ads can be described as mawkish and cheesy, but the four spots are aiming for new demographics that Apple’s previous campaigns may have missed: older generations and teens–although whether any teenage tearaway with half a pound of iron in her mouth will pester her folks for an iPhone after this campaign remains to be seen. What we really want is an ad that uses the new iChatr app, inspired by ChatRoulette.